Well dispersed semi-aromatic polyamide(PA)/multi-wall carbon nanotube (MWCNT) composite was prepared through high-speed shearing method in the presence of surfactant sodium dodecylbenzene sulfonate (SDBS). 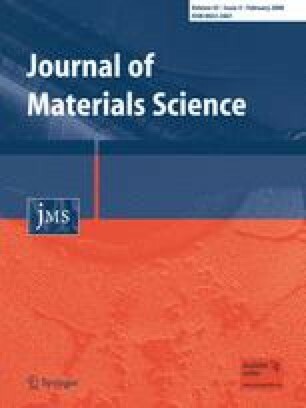 Further analysis of morphology, crystallization, and dynamical mechanical properties shows the presence of SDBS helps to disperse the MWCNT and largely enhance the mechanical property. In comparison with neat PA component, the storage modulus (E′) of the blend system at 90 °C is 3.5 times larger than PA with MWCNT load ratio of 3 wt.%; and meanwhile the glass transition temperature (Tg) of PA component increases about 17 °C; Similar phenomena have not found in MWCNT/PA composite without surfactant. Simultaneously, as DSC and morphology measurements indicate, the filled MWCNT does not show tremendous effect on the crystalline phase and crystallinity of PA, which imply that the increasing mechanical property for composites is due to the strengthening effect of MWCNT itself, not being caused by the change of crystalline phase and crystallinity by the addition of MWCNT. The increasing Tg, indicative of the restricting movement of PA chains, is most probably ascribe to the strong interaction presented between MWCNT and PA chains. This work was partially subsidized by Henan Innovation Project for University Prominent Research Talents (“HAIPURT”) program.